Memorial Park is located in central Athens. 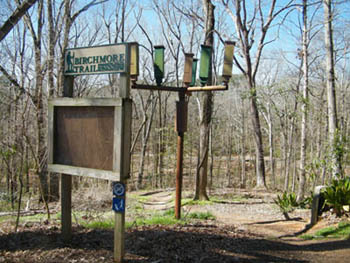 Historically, the property was owned by the Birchmore family and was donated to Athens/Clarke County as a public space. Unfortunately, several species of exotic plants have run amok in the park, which has caused the decline of many species of native plants, birds, and other wildlife. Towers of English ivy and wisteria have smothered the ground and burdened large trees with the weight of their heavy vines. Japanese honeysuckle, autumn olive, non-native bamboo, Nandina, and other plants dominated the understory, choking out our less competitive and more fragile native wildflowers. Sadly, many of these invasive plants are still frequently planted as ornamentals, despite the harm they do to the surrounding countryside. The Weed Warriors project began in 2009 to try and help the park's native plant and wildlife species recover from the effects of invasive plants. So far they have removed several acres of invasive plants by hand! Although at first the removal of so much green vegetation looked out of place, our native wildflowers are quickly returning. 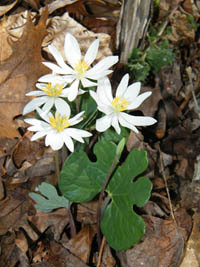 Bloodroot, trilliums, geraniums, violets, Jack-in-the-Pulpits, and many other species of native flowers have blossomed since being freed from the pressure of the invasive plants. The project is now managed by Athens-Clarke County. Interested in becoming a part of this amazing crew? The Weed Warriors meet every first and third Saturday, September-April, from 9AM-12PM. Bring your gardening gloves, camera, and good shoes! Check out the Weed Warriors Facebook page to keep updated and get involved with this very important project! For more details about volunteering, visit the Athens-Clarke County Weed Warriors site.